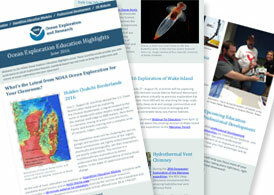 Each month, the NOAA Office of Ocean Exploration and Research offers a newsletter for educators that provides dates and locations of Professional Development Programs and online offerings, notifications of upcoming NOAA Ocean Exploration Expeditions and associated lesson plans, and information about the OceanA.G.E. (Another Generation of Explorers) ocean career offerings. Below, you will find an archive of past editions in PDF format. Adobe PDF reader will be required to view PDF documents. If you would like to subcribe to our educator newsletter, please sign up here.